So what’s happening with the business? Passengers keep asking us this as they book their annual (some bi-annual or more 🙂 ) jet boat fix. We said that we would hand over the Venture Jet helm if we could find someone who would be able to take the business on and for whom it would work. 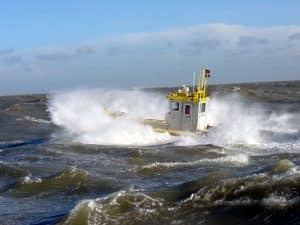 That person would need to be able to run a business but also have a passion for boats and wildlife and a degree of sea experience on RIBs (ideally with jets) to cope with Ramsey’s challenging waters. That hasn’t happened yet so the business remains for sale as we enjoy our final season and then retire. Shearwater will remain with us so we’ll do some charters and group trips in 2019 (but not daily scheduled trips) until we rehome her. There are some great adventurous homes for her in experienced hands overseas. It’s simply not realistic to train someone from scratch to do what we do in a limited time frame and if we sold to someone without jet boat expertise frankly Venture Jet wouldn’t be Venture Jet and it wouldn’t work for the new owners or their passengers. 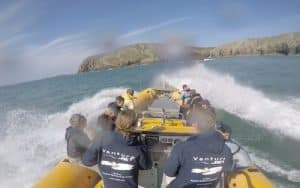 Running Venture Jet takes more commitment and expertise than might appear as we play around at sea but we’re happy to discuss the possibilities with anyone contemplating taking on our jet boat adventure and making it their own. At the moment there’s time to get the right person up to speed for next year or even later this season and we’d be happy to provide some ongoing support and training should they wish. While Venture Jet could be relocated most people naturally want to continue the business here in Pembrokeshire so they face a significant relocation. Whether or not that’s possible depends where they are in their careers and families. This is a cracking lifestyle business so if you’re interested please contact us on 01348 837764 or info@venturejet.co.uk. Will there be any Jet Boating in St Davids in 2019? If someone comes forward who is able to take over the business we’ll give them every support as they make the business their own. If not we’re happy to retire the business as well as ourselves and enjoy the boat until she’s rehomed. She’s a bit heavy duty to be a retirement boat but frankly we’ll enjoy it while we have the excuse! While Shearwater remains with us we will continue to run some trips for groups / charters in 2019 but we will not be running scheduled trips daily as we do now. We look forward to visiting Shearwater’s Ocean Dynamics siblings around the world – see Atlantic Eagle right, working as a rescue and support vessel in the North Sea. I’m sorry that our passengers don’t have this luxury. If we come across some good adventurous boat trips then we’ll post the good news. Scotland looks like it has some interesting possibilities 🙂 . As for now we’re enjoying the salt spray around Ramsey as usual. See you out at sea 🙂 .